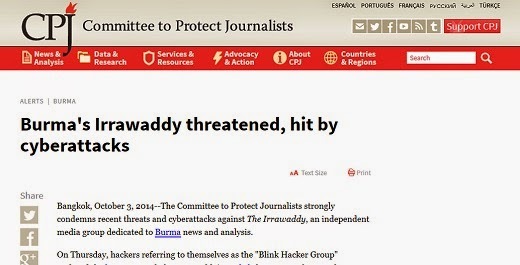 On Thursday, hackers referring to themselves as the "Blink Hacker Group" replaced the home page of The Irrawaddy's English-language website with a message accusing it of supporting "jihad & radical Muslims", according to local and international news reports. The message also criticized The Irrawaddy's "so called freedom of speech" and justified their actions by "so called freedom of Internet hacking." The cyberattack disabled the website for approximately four hours, according to an Irrawaddy technical staff member who communicated with CPJ by email. On Friday, The Irrawaddy's website was shut down for over an hour by a separate denial of service (DOS) attack, according to Win Thu, an Irrawaddy staff member. Journalists and news outlets in Burma, particularly those that have reported on conflict, have come under frequent cyberattack in the past couple of years, and some editors suspect military involvement, according to CPJ research. The government has consistently denied responsibility for the attacks. "There are strong suspicions that military authorities may be behind the threats and attacks on The Irrawaddy," said Shawn Crispin, CPJ's Southeast Asia representative. "President Thein Sein should oversee a truly independent probe to ascertain whether that is the case and punish under applicable law any officials found to be complicit.
" Editor-in-Chief Aung Zaw told CPJ the first cyberattack was likely motivated by The Irrawaddy's coverage of Burmese Buddhist monk U Wirathu's recent trip to Sri Lanka, where the controversial ascetic entered an agreement with a radical Buddhist organization based there to "protect and defend threatened Buddhists the world over facing a serious threat today from jihadist groups.
" Burma's Muslim minority groups, including the persecuted Rohingya group, have in recent years been targeted by extremist groups led by fringe elements of the Buddhist clergy. In recent opinion and analysis stories, The Irrawaddy has raised questions about whether the extremist groups, including U Wirathu's 969 movement, receive tacit support from the military. On September 29, an anonymous caller threatened to "burn down and bomb" The Irrawaddy's Rangoon-based bureau over their news coverage of the U Wirathu visit, according to Win Thu and news reports. The story's reporter, Thalun Zaung Htet, also received a number of pseudonymous death threats on The Irrawaddy's Facebook page, Win Thu told CPJ. The first cyberattack came one day after the announcement that Aung Zaw is among this year's four recipients of CPJ's International Press Freedom Award. The announcement noted that The Irrawaddy's website has frequently come under cyberattack during critical news junctures, including during the previous military government's lethal suppression of the 2007 Buddhist monk-led Saffron Revolution.